Cinema Rooms The Cinema Room consisted of a 5.1.2 Dolby Atmos system using Artcoustic loud speakers, Screen research 240:1 screen, Epson LS-10500 laser 4k projector, Integra DX7 AV Amp, Panasonic UB900 UHD player, Rako lighting control, RTI system control and Schepel MK1 AV furniture. This newly upgraded house in Ongar upgrade to new décor with designer wallpaper and kitchen. To complement the new look a Samsung QE65Q9FN 65″ QLED HDR 2000 was installed with multi-room sound. The ambient mode on the TV blends the designer wallpaper fantastically well. In-ceiling speaker in the kitchen and dining room fill the ground floor with amazing sound. Not only does the client have a brand new kitchen but a brand new TV and sound to complement it. A family TV room was in need of a refresh. The current family TV room which was infrequently used with big floor standing speakers and plasma TV needed to be changed. 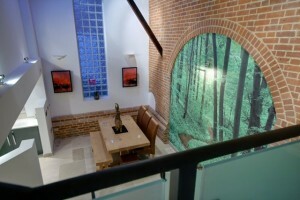 This was the clients brief so we set about coming up with design to transform the room from what it once was. 3D Room designs help our clients see what can me achieved in their own homes so from concept to completion the room was transformed. Now with Artcoustic on wall speakers, Sony 75 inch 4k HDR Dolby Vision TV with bespoke cabinet work to house all equipment. 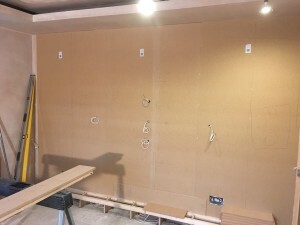 Fabric wall panels were added with walls painted to complement the rest of the room and cabinet. The room is now used more frequently and looks and sounds amazing. An old out-building that used to be a bar & games room was in need of an upgrade. 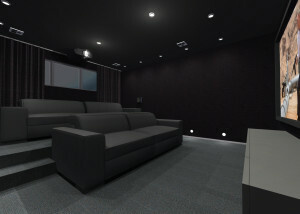 This room was 6.1 x 6.6 and an ideal size for a dedicated cinema room. Two rows of seating were required for the whole family and friends. After a visit to the showroom and a short survey to the property 3D concept design was created so the client could see what to expect upon the finished room. Being a large room a large subwoofer was required so the Artcoustic PS6 with 6 drive units in was the sub of choice. Artcoustic 6-3’s for the front with Target rears and Atmos in-ceilings. This 7.1.4 Dolby Atmos system also consisted of a Denon AVR 3400, Panasonic 4k UHD Blu-Ray player, Epson TW9300 Projector and a 3.5m wide UHD projector screen. We designed the whole interior design including carpet and fabric walls. LED spots and RGBW strip lighting controlled via Rako lighting was used to really show of the room and Farrow & Ball paint colour finish. Cinema seating consisted of two large lounge sofas and four reclining cinema seats for the rear. Not only did this room look and sound amazing it exceeded expectations! A spare room that used to be a kitchen to be a cinema room! This was the brief that we had from the client as we designed the cinema room. After an extension to the house the old kitchen and the room was no longer in use. The room was to have a large screen, projector and two rows of seating. 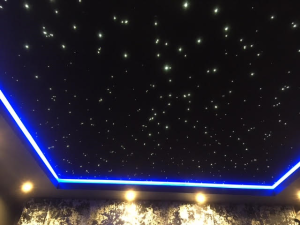 A star ceiling was also suggested which the client liked. The early stages were discussed and designed and with a visit to the Artcoustic showroom the speaker package and the rest of the equipment were chosen. The Cinema Room consisted of a 5.1.2 Dolby Atmos system using Artcoustic loud speakers, Screen research 240:1 screen, Epson LS-10500 laser 4k projector, Integra DX7 AV Amp, Panasonic UB900 UHD player, Rako lighting control, RTI system control and Schepel MK1 AV furniture. The room not only looked good with the fabric wall and star ceiling but sounded fantastic too. 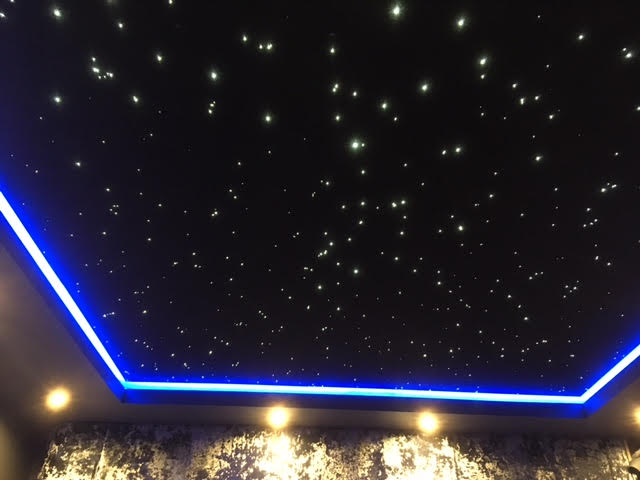 The kids loved the star ceiling! The only problem was there was a lot of work to do get it to this stage. 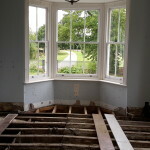 All floorboards had to be replaced and thermal insulation fitted to stop any cold from coming from the cellar below. We decided to actually bring the screen forward from its recess and install a comms room behind to keep the equipment in and to have a neat minimalistic look. A 3D design was completed so the client could see what the room would look like once finished. 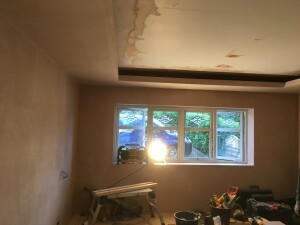 Once the room design had been decided a stretched ceiling was suggested to hide the structural beams that were on show and to enable the use of Atmos speakers and led lights. 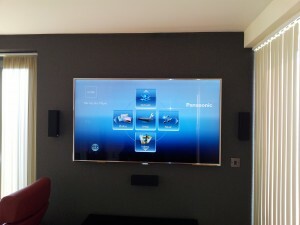 For the throw distance we had a 110 inch screen would be correct and fit nicely between the false wall location. 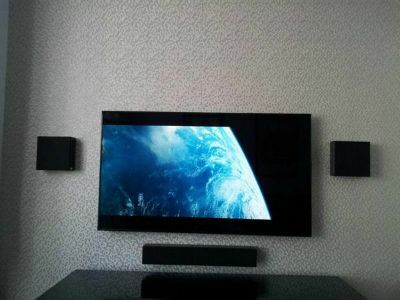 With regards to speakers we needed a slim design to not only fit behind the screen but to sit nicely on the wall. Artcoustic loud speakers were chosen consisitng of 3x Artcoutic 6-3,s for the fronts with 4x Artcoustic Target speakers for side and rears and 4 x 2-1’s for the Atmos in ceilings. 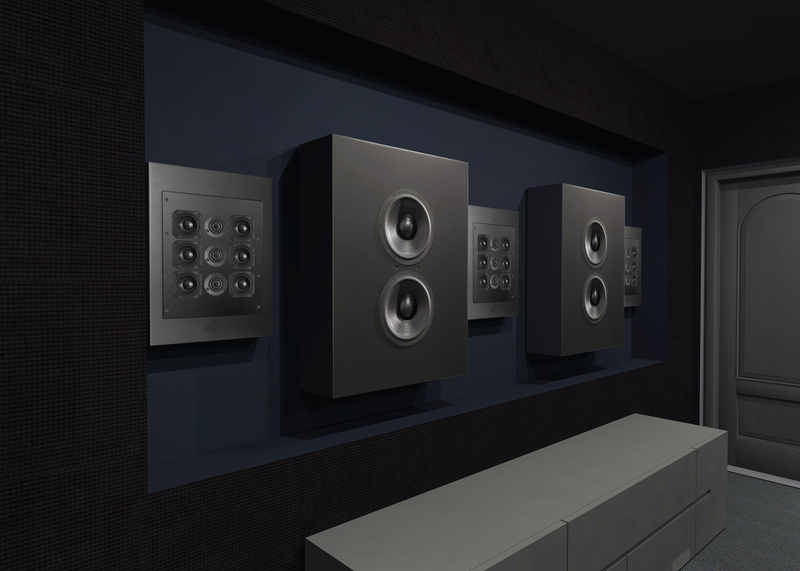 As we had the space a Artcoustic p6 sub was chosen which would allow us to fill the room with controlled deep base. To get the best out of the new Sony VPL 520 projector a Screen Excellence 4k screen was chosen. 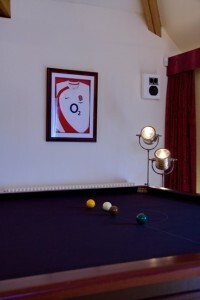 The rooms decor was finished off with Rako controls for lighting and blinds and RTI for complete control of the system. All in all the client is very happy with both the look,sound and ease of use. 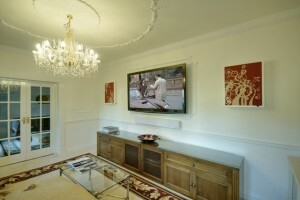 With this newly purchased home the client required a dedicated tv room. It was decided that this room would be decorated with stylish wall paper and paint that complemented the room. A bespoke cabinet and sofa were chosen along with a coffee table to match the sofa. A 4k Samsung 55″ TV with Integra Amp along with Artoustic 5.1 speakers were used to create a stylish minimalistic look in the room. 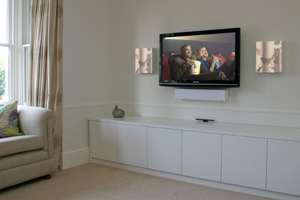 Using a PS4 and SKY HD for picture this room offers a great picture and sound for the whole family. This unused garage was in need of a conversion and a Cinema Room is just what this client wanted. 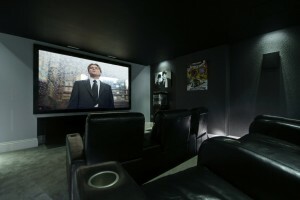 A brief was provided to design and install a top of the range cinema room in this clients unused garage. 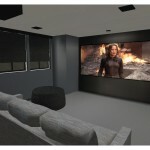 Together with the client and our room designer we set about designing the perfect cinema for the space provided. 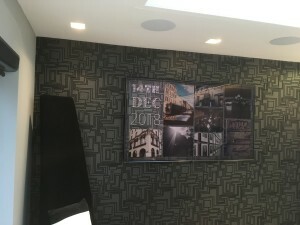 A visit with the client to Artcoustic’s dedicated cinema made the choice of speakers an easy one. The speakers helped us make the most of the room without taking up much space and enabled us to place the speakers behind the screen so the image could be as large as possible. Once speakers,projector and AV equipment had been decided,which included JVC X55,Onkyo 818 amp,Oppo 105 and Screen Excellence 4k 2.54m wide screen we set about designing the room. Wall paper,carpet,lights,cabinets,door handles were all chosen to get the best out of this garage conversion. 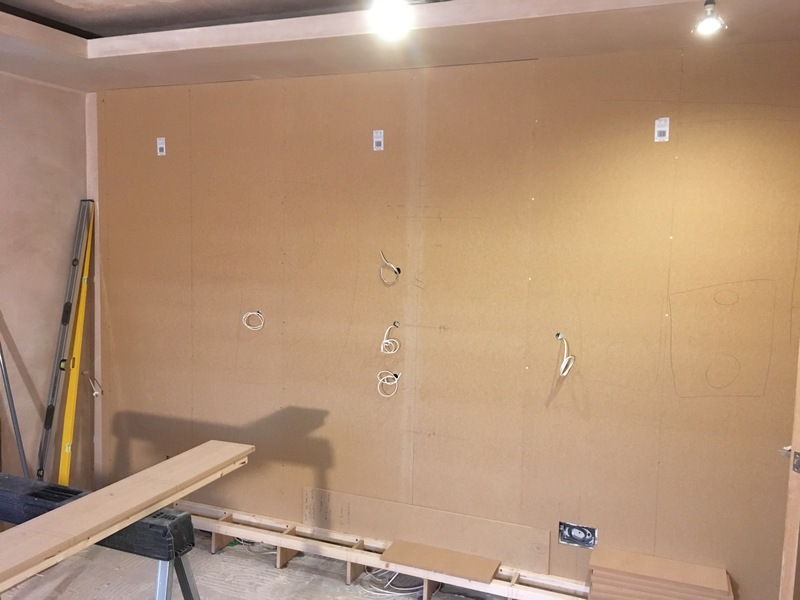 With the garage attached to the house and having two doors which the client wanted to keep it was decided to clad the doors in the same fabric as the front wall and cabinet. This would mean the finish of the doors the other side would not look out of place to the rest of the house. Rako lighting was used to enhance the colour scheme of the room with LED down lights and strip lighting used throughout. The result is a truly fantastic room that you would never know had once been a garage. The ecstatic client could not wait to use the room and now listens to music and movies more than he ever thought he would. In fact this room was for the whole family so kids play for a limited time on their consoles and the family can watch movies and sporting events whenever they like. 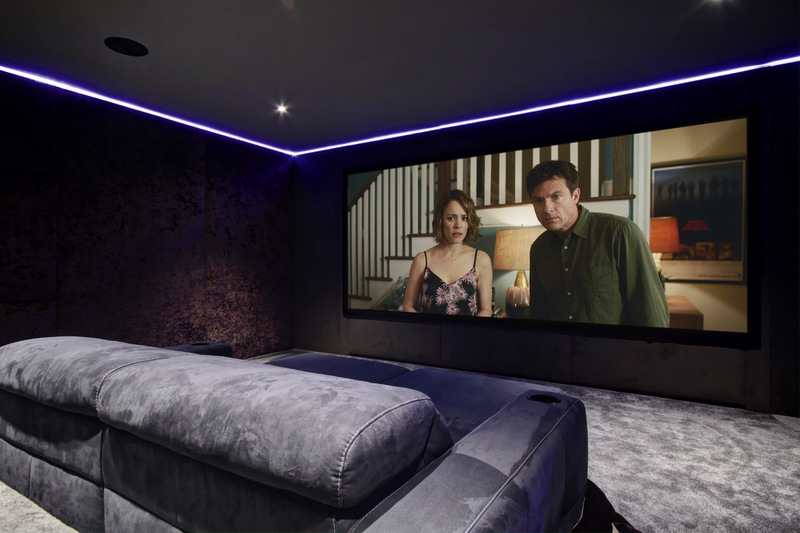 A newly renovated home in the Epping Forest district needed a Cinema Room. 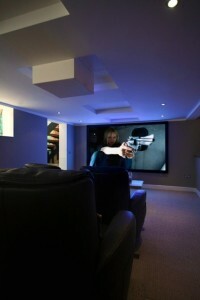 This property with it’s new extension and front gates needed a Home Cinema Room. This was the clients comment of what was needed. A large screen was required so a 3.05m Screen Research screen was chosen with a JVC projector to supply a fantastic image. All equipment was housed in a dedicated rack cabinet that included Onkyo,Sony and Sonos which gave multi-room music to the rest of the house. Sound was supplied via Artcoustic speakers with three Spitfire SL 8-4’s and 180-43 SL subwoofer and SL Target rears. Lighting plays a very important part in any cinema room and this is all taken care of with Rako lighting control. Fun for the whole family and friends ‘3D is a blast’! We doubt this client will go to the cinema every again! This fantastic apartment overlooking the Thames Estuary needed an upgrade in the Home Cinema department. Out went the old all in-one system, DVD recorder and TV and in it’s place a state of the art Samsung 8000 60″ LED, Denon 5.1 AV amp, Panasonic Blu-ray player and 5.1 Artcoustic speakers. 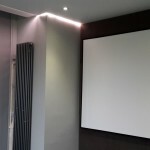 All the equipment was housed in a specially designed parapan bespoke cabinet which also concealed the sub which was on the wall. This fantastic room with the ultra slim design of the TV which is only 30.45mm in depth and speakers helped transform this penthouse apartment into a cable free minimalistic 3D movie haven TV room. 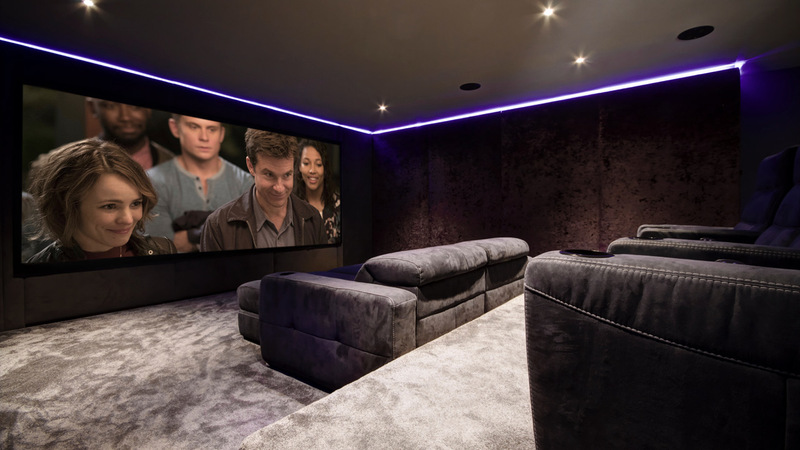 This dedicated family Home Cinema Room is another beautiful private cinema by Cinema Rooms. Featuring a JVC 1080p projector, Screen Research screen, Rako lighting and Artcoustic Spitfire loudspeakers including 3 x Spitfire Venue installed as left, centre and right speakers behind the acoustically transparent screen, along with 2 x Spitfire Subwoofers for LFE. Diablo Monitors complete the 7.1 system. The client and his family use this room every day and said ‘this is the best amount of money i have ever spent’. This room was a complete room design from scratch and included design for the wall paper, carpet, star ceiling and cabinet. More details can be found here The client is thrilled with the system and uses it almost every day – as most of us would given a dedicated private cinema as stunning as this one. 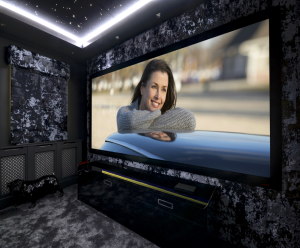 Thorough planning and design of our systems is what enables us to deliver superb high quality cinema systems into even the modestly sized living spaces. 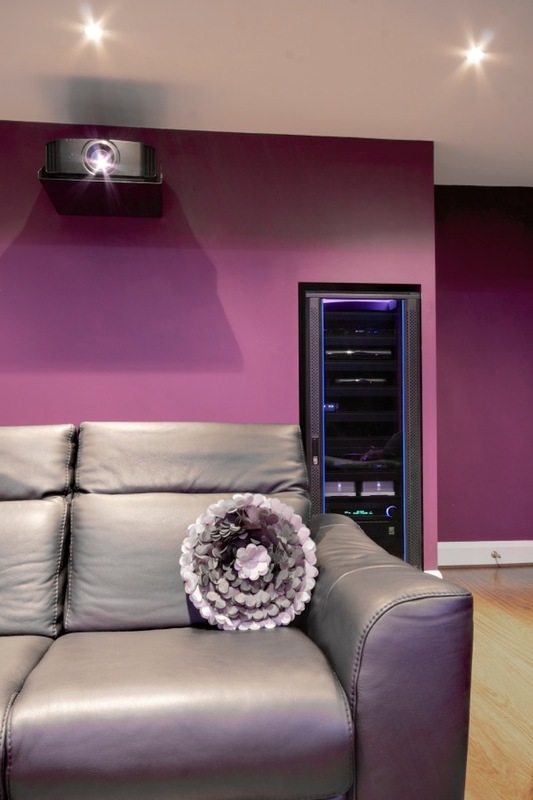 This lounge features a full digital 5.1 system and a 3D TV. The cabinetry was designed and built in consultation with the client by our own specialists, and houses high quality electronics from Denon to power this system. A Panasonic 65″ 3D TV delivers an incredible picture, and the Artcoustic DF65-50 5.1 system provides a stunningly realistic soundtrack, all within a very sensible budget. This installation shows just what Cinema Rooms can do when asked. 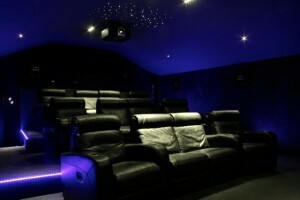 The client is a BAFTA award winning producer who required a state of the art dedicated cinema in his home. A long time was spent in consultancy with the client to meet his every requirements, and discussions lead us to design the room with 12 luxury reclining cinema seat, a state of the art Vivitek projector, top of the range Denon electronics, Artcoustic’s Spitfire range of loudspeakers, complete Rako lighting and blinds control and Crestron iPad system control. The result is an award winning installation capable of the very best picture and audio, in the comfort of the client’s own home. The system is fully calibrated to ensure the what the clients sees and hears from his movies is exactly what the director intended. 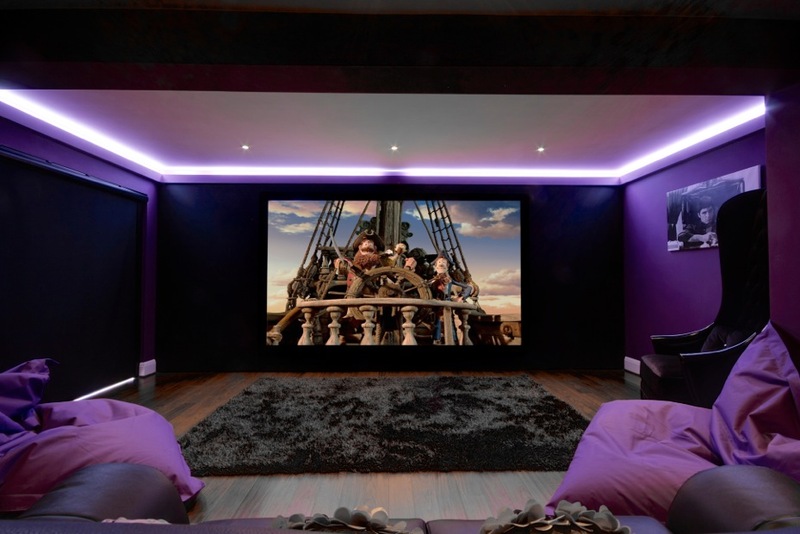 A truly stunning Cinema Room. 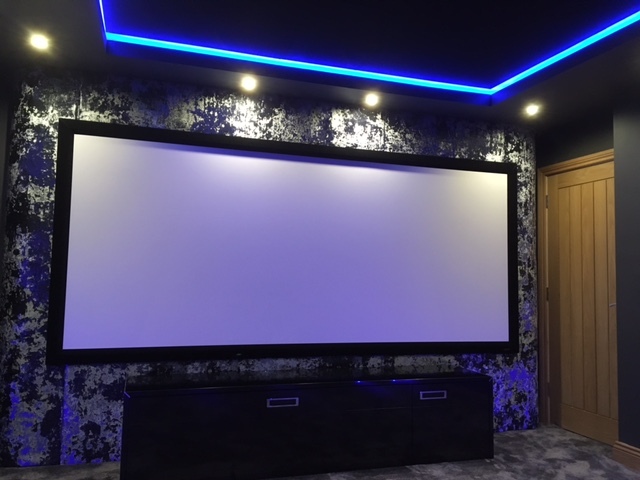 Cinema Rooms were asked to provide a complete solution for this client’s Basement type room, asking for a reference quality dedicated cinema as well as music around the home. 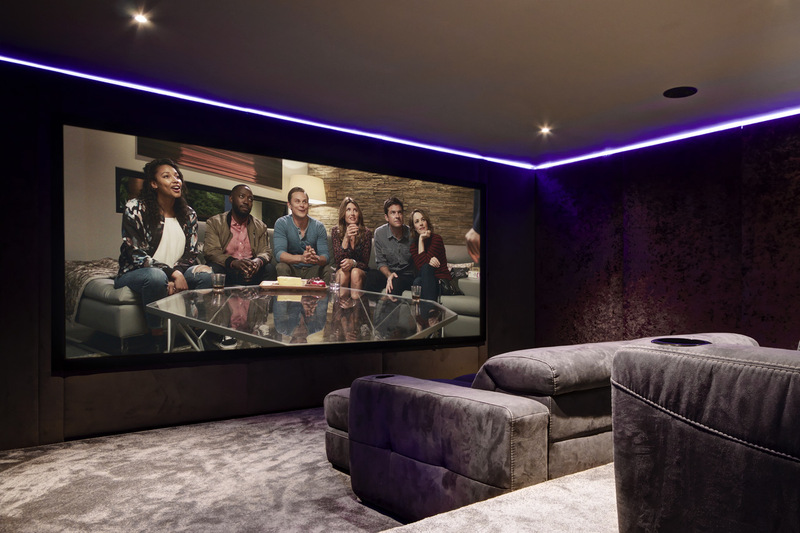 The dedicated basement cinema was designed to the highest specification after many meetings with the client to determine his exact requirements. The stunning JVC 990 was used to produce a stunning picture and housing built to keep the installation neat. 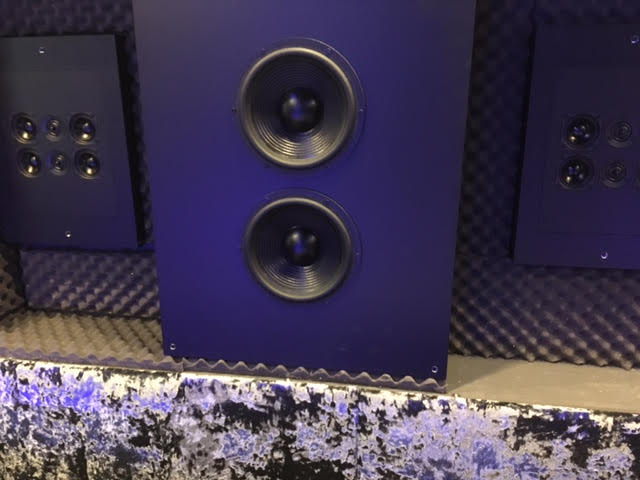 Top of the range Denon electronics was used together with the Artcoustic Spitfire loudspeaker range to deliver an incredible complete 7.1 system. 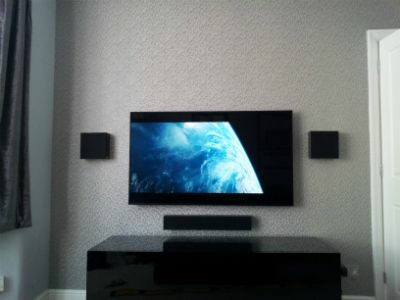 Picture and sound are fully calibrated as Cinema Rooms does to each and every system we commission. The rest of the property uses a combination of Sonos, high quality in ceiling speakers and on wall Artcoustic Superstar loudspeakers to deliver high quality aesthetics together with high quality audio performance throughout. 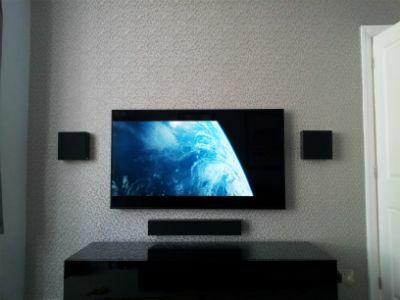 This simple installation incorporates a 3D TV with a full digital 5.1 sound system. A quality integrated amplifier from Onkyo and Diablo speaker system from Artcoustic provides outstanding audio quality whilst keeping the aesthetics of the room clean and sharp. The cabinet to house the electronics is bespoke and was also designed and built by Cinema Rooms. 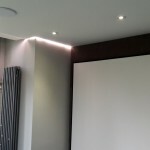 The full design, installation and calibration was all carried out within 4 weeks and kept to a modest budget. 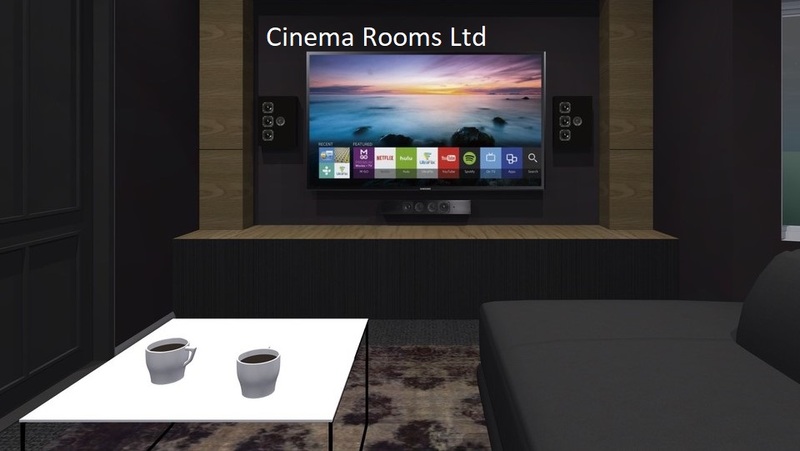 Cinema Rooms expertise extends beyond 5.1 cinema systems and into complete multiroom system. 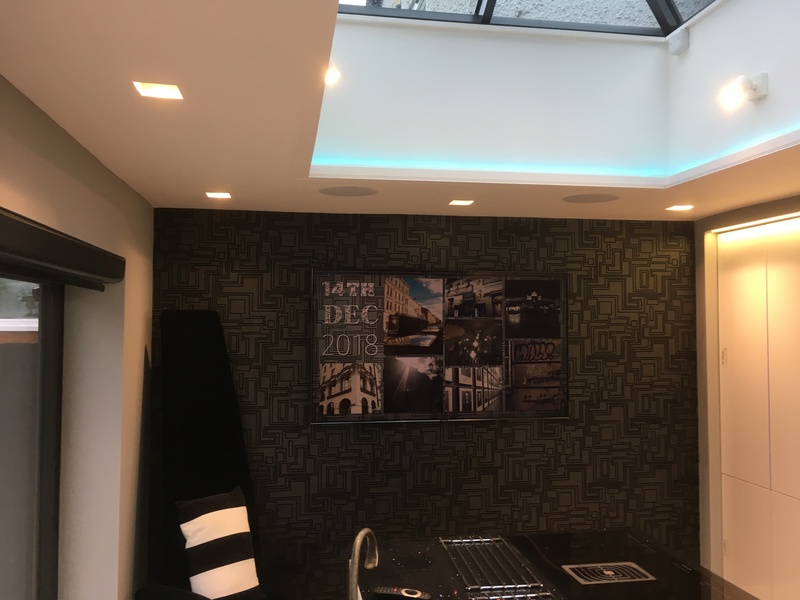 Quality audio was acheivable in this client’s swimming pool with a combination of Artcoustic Superstars and the excellent Sonos system, driven with high quality power amplifiers to get the very best from it. The Sonos S5 was also utilised in the kitchen area and bedroom for a simple but elegant multiroom audio system. 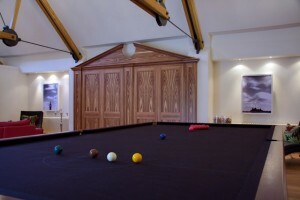 The client asked us to provide stunning audio for this beautiful games room. 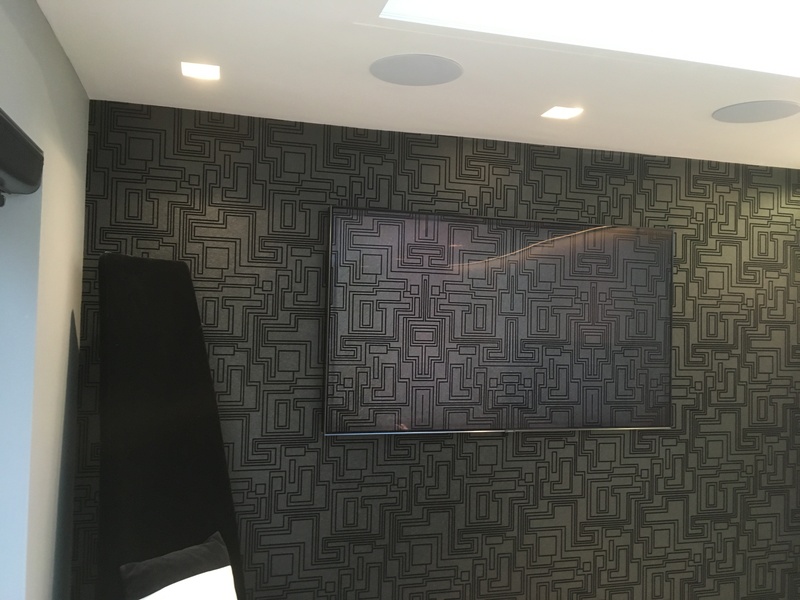 We designed and installed the system around some existing electronics, upgrading where appropriate, and utilising a combination of on wall Artcoustic speakers to fill the room. The result is an amazing entertaining space with an audio system to match.